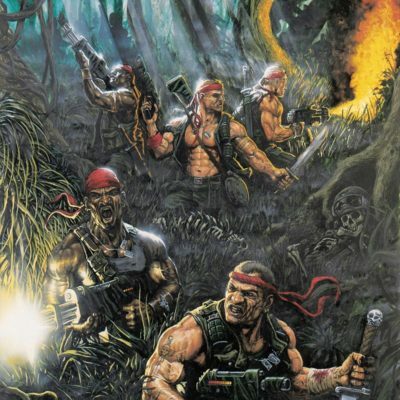 Anyway, this week I’ll be looking at the infamous Catachan Jungle Fighter. 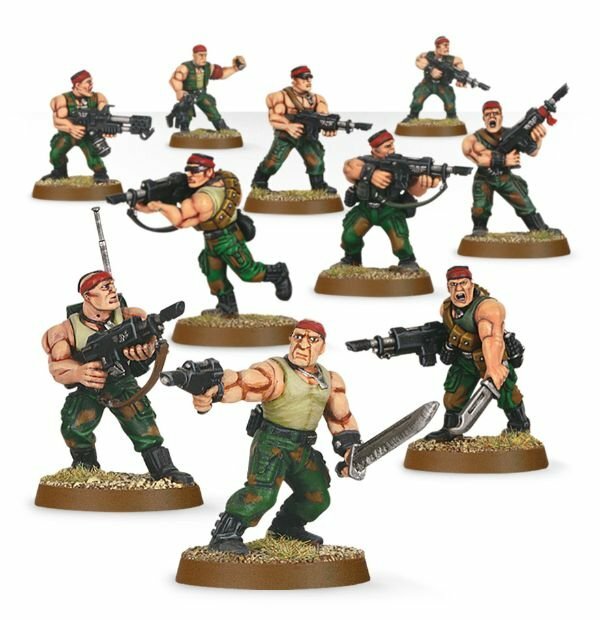 Before going any further I want to go on record as saying that amongst the worst, fugly and downright dated miniatures in the GW catalogue are the Catachan Jungle Fighters. But wait, I’m referring to the plastic models. Strange then, that their original sculpts (released a years before the plastics) should be so vastly superior. Look at this guy! The Catachans are born on a Death World of the same name. This world is the three-way lovechild of Pandora, Predator and Audrey from Little Shop of Horrors. Quite simply, its denizens want nothing more than to poison you, incubate inside you and then explode you everywhere to scatter seeds. Yikes. And they’re the nice ones. So, what kind of humans could survive in a place like this? – Thrive in a place like this? – Make pillow cases out of the most dangerous fauna in the known universe? 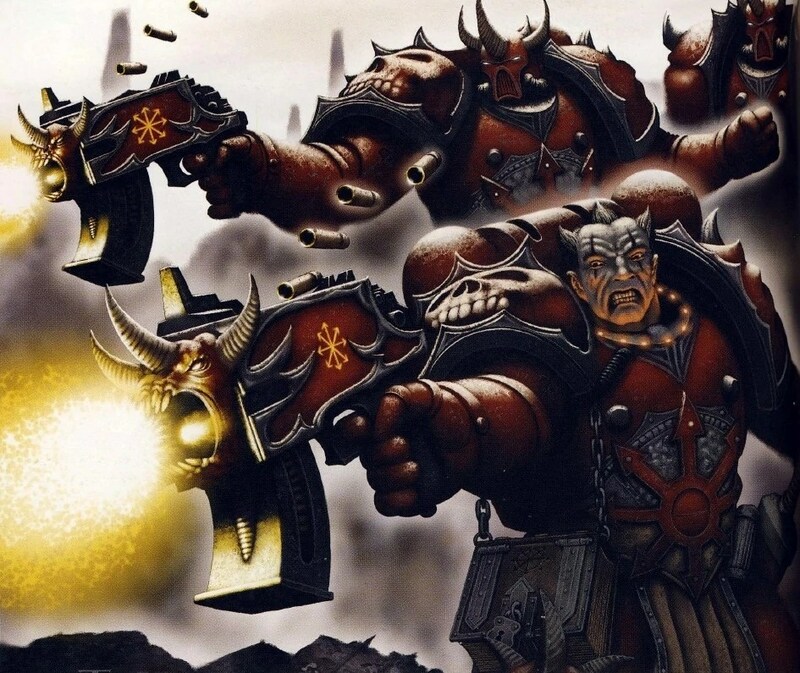 These men who make up some of the most magnificent soldier stock of the Imperium of Man? Hard ones apparently. The aesthetic result is heavily, unapologetically drawn from Stallone and Arnie and their adventures in the South American and Vietnamese jungles. These sculpts are pure, unabashed testosterone fuelled visions of soldiery, a vision as out of step with reality as was most of the pop culture of the 80’s and 90’s. Forget the fact that they’re not wearing any body armour, or that they’d have to consume about 10,000 calories a day to stay that size. Even if that mass was some kind of genetic predisposition, it serves little purpose other than to intimidate the overwhelming horde of mankind’s enemies, most of which sadly cannot be intimidated by any means. No, it is the guile, cunning and will to survive that truly makes the Catachans what they are. Or so we’re told. Surely they should be unstoppable on the tabletop? Wait? What? Yes. Those are the stats. Those are Rambo’s stats. In the 41st Millenium, a one man army of the 80’s is nothing more than a footsoldier, a worthless, forgotten instrument to be spent needlessly and without hesitation. 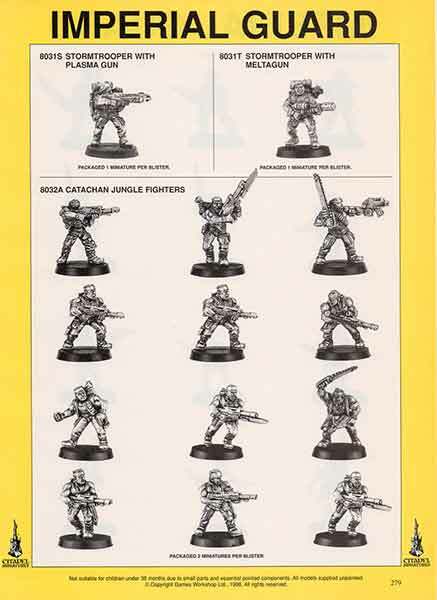 These sculpts were released when Second Edition was alive and kicking. Though unstoppable looking on the tabletop, they would face up to their foes – the Tyranids. There they are now, the Guard of Catachan, lined up in a formidable gunline, entrenched in bunkers and trenches with a Leman Russ in support, ready to ‘pour it on’ those foul xenos. Then the Tyranid player pulls out a strategy card. A barbed strangler bursts out of one of the hapless guardsmen, killing three of his fellows. This entry was posted in Uncategorized on 27/04/2017 by darkfuture. Last weekend, three friends journeyed to my gaff to enjoy two days of hobby. It was a superb weekend and really galvanised my enjoyment of gaming in general. I’ve been friends with two of the guys for about twenty years now and Nick for nearly ten. Curiously, none of us met through the hobby, but it has served to bring us closer together and I’m indebted to them all for making the arduous journey! 40k was the common denominator, so I dusted off my Marines Malevolent, allying in with James’ Knights Unyielding to do battle against Nick and Alex’s chaotic forces. We played three games apiece over two days, including two doubles games. Great fun! After the dust had settled, I resolved to do several things before the next meet up. Paint up a small 40k force. 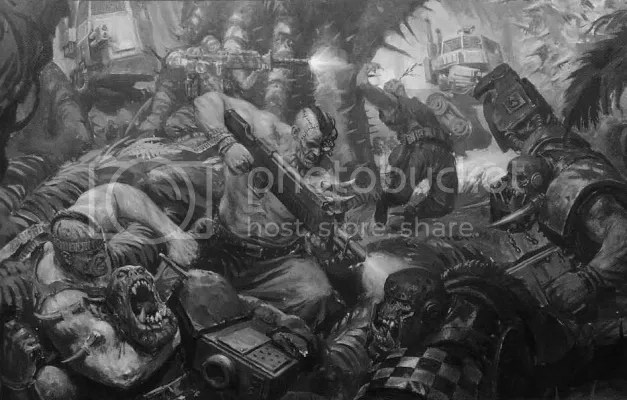 At the moment I’m leaning towards Genestealer Cults. Commit to building a table that is functional, but akin to a diorama in scope. I photographed him when I returned using Tablewar’s new ‘Macromat’ which I supported on Kickstarter a few months back. It’s fantastic and has really elevated the standard of my humble IPhone 5C’s camera. That said, I’m definitely going to get a new phone soon as I’m sick of taking subpar pictures. The Macromat comes with several other backgrounds, including the classic ‘blue to white’ that harkens back to White Dwarf of old. If you’re interested in taking beautiful pics of minis, I heartily recommend giving them a look. These containers are from TTCombat. Initially sceptical of laser-cut terrain, I am now a firm convert and have a huge amount more to assemble. This entry was posted in Uncategorized and tagged 40k, general hobby, macromat on 18/02/2017 by darkfuture.